Antun Suhor was born on December 30, 1862, in the small village of Nakovanj on the peninsula of Peljesac, which is part of the region of Dalmatia. At the time of Antun's birth, Dalmatia was included in the Austrian empire, but is now a region of Croatia. He was the only son of Miho Suhor and Francisca Splivalo. He also had an older sister, Ana. At an early age, Antun left Nakovanj on a sea-going ship and emigrated to the United States. In his early twenties he settled in New Orleans, Louisiana, where he remained for the rest of his life. He became a captain in the Bar Pilots Association of Louisiana and navigated ships through the mouth of the Mississippi River, taking them either into the river or into the Gulf of Mexico. 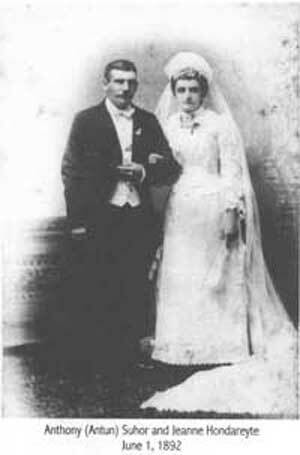 In 1892 he married Jeanne Hondareyte and they made their home at 4117 N. Rampart St. They were the parents of John Michael, Frances Ursula, Joseph Urban, Anthony Bernard and Leonie Agnes Suhor. Antun's five children were born at 4117 N. Rampart St. That site was originally occupied by a smaller house, which was moved to 1023 Mazant St. so that a larger house could be constructed. In November, 1905, shortly after boarding a steam ship to pilot it into the Mississippi River, Antun Suhor suffered a heart attack and died aboard the ship. John Suhor married Loretta Roth and they lived in the "renovated" house at 1023 Mazant St. All three of their children were born there. When Jeanne Hondareyte died in 1936, John moved back to 4117 N. Rampart and stayed there until 1951, at which time he moved to 937 Mazant St. He and Loretta resided there until their deaths. Joseph Suhor married Anna Ruth Small in 1920 and lived at 4117 N. Rampart until he built a house at 1124 Lesseps St. in 1924. Urban, Dan and Leo were born at 4117 N. Rampart. Albert was born at 1124 Lesseps. In 1944, Joseph sold the house to Leonie and Ernie Roth and moved to 1023 Mazant St. Joseph died there in 1975. Anna Ruth moved to a nursing home in February 2000 and died there in May 2002 at the age of 103. Frances and Leonie Suhor lived at 4117 N. Rampart until 1936, when they moved to 1308 Bartholomew. Leonie married Ernie Roth in 1940, and after a short stay in Natchez, Mississippi, they returned to New Orleans and lived at 1023 Mazant. In 1944 they moved to 1124 Lesseps and were living there when they died. Frances moved from Bartholomew to 1305 1/2 France St., then to 1127 France, and finally to 1029 Mazant St. She lived there until she went to St. Margaret's Daughters nursing home, where she spent the last 16 years of her life. 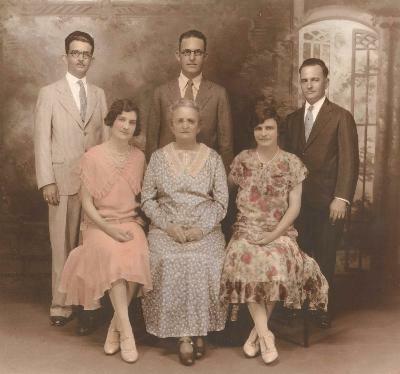 Antun's five children and their spouses, all New Orleans born, remained close throughout their lives, residing in New Orleans until their deaths.